I mentioned in an earlier post that for some years I had worked in jobs in aerospace and aviation. In one of those positions I worked at a flight test facility at the Mojave Airport in southern California. My employer manufactured jet engines. Engines that needed to be tested for FAA certification were shipped out to us and we would install them on a Boeing 747 test aircraft and fly them around to conduct the required tests. Most often engines would be delivered to us by truck, but occasionally they would be air-freighted to us if there was a hurry-up schedule. On one occasion, one of these expedited tests involved the largest engine that we made, a 100,000 pound thrust beast that is used on the Boeing 777. The only aircraft commercially available large enough to carry one of these (the Air Force wouldn’t lend us a C-5 ) was an Antonov An-124, a large Soviet-designed cargo plane that is a relict of the Cold War. 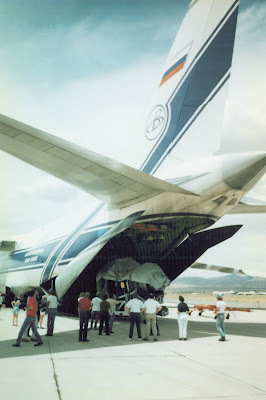 This plane was operated by the Russian carrier Volga-Dnepr Heavy Lift, and my employer paid something like $200,000 per trip for them to haul our engines, usually spares from the factory to overseas service depots. Production engines were trucked up to Seattle for installation at Boeing. 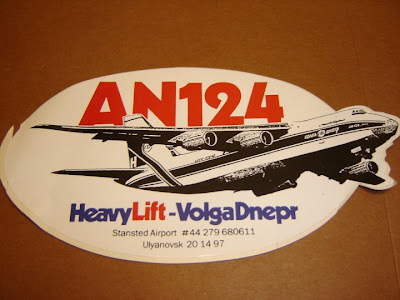 On this occasion, back in the mid-1990s, the An-124 was bringing us a spare engine from our service shop in Wales. They loaded the engine at Gatwick and flew non-stop to Houston, where they cleared customs. That plane has legs. They refueled and flew on to Mojave. Here’s a picture of it after it landed. You can see Volga-Dnepr in Cyrillic on the side of the fuselage. There was a privately-owned MiG-21 at the airport whose owner kept it parked just off our area of the flight line. I was lucky enough to catch these two old Soviet veterans in one picture. I’d inspected the MiG closely several times and it intrigued me. On one of those visits I was accompanied by one of our test pilots. 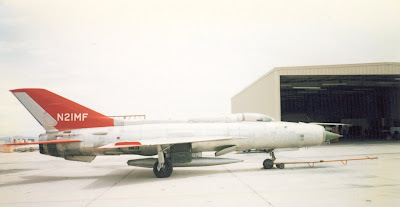 He claimed it was the closest he’d been to a MiG-21 since one shot him down in his A-4 over Hanoi. I don’t know where the MiG was built, but all the placards on the hull were in Polish. It was made of high-quality aerospace aluminum, but all the fasteners used on the wings were of carbon steel. This left the shiny surface of the wings spotted with rust dots from the corroded fasteners. It seemed to me emblematic of many of the contradictions of the Soviet system. 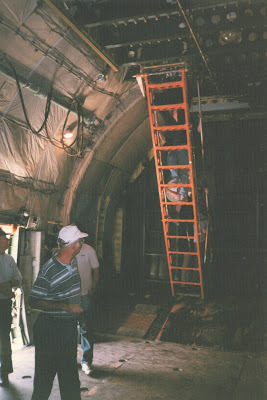 Seventeen was an absurdly large crew for the work that needed to be done to operate the Antonov. As we worked on some classified programs at our facility, our security officer was required to review the Russian crew manifest before their arrival. A scan of their names by our security services indicated that 14 of them were known to be working for various Russian intelligence agencies. They obviously weren’t let in to see anything in our shop, and we were told to keep our eyes open for anything unusual. It is an enormous plane, and we were allowed the run of it – we wanted our $200,000 worth. The ladder goes up to the cockpit. Here you can see us unloading. Here’s the inside of the cockpit. Very 1960s looking. 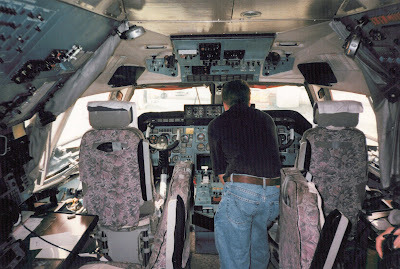 It’s the only modern cockpit I can ever recall seeing with a radio operator crew position. In the time-honored way, we traded patches and stickers with the Russians. I was actually able to find this sticker after all these years. The Antonov was due to fly out the next morning and we loaded the crew in a couple of vans and took them to a motel in town. Their flight plan called for them to fly from Mojave to Las Vegas to re-fuel (Jet A was expensive at our airport) and clear customs, then non-stop back to Gatwick. We all came out to the flight line the next morning to watch them take off. As the Antonov took to the air we expected them to head northeast toward Las Vegas. But they didn’t. They circled and headed straight south, flying along the boundary of the “no fly zone” that keeps private and commercial aircraft from flying over Edwards Air Force Base, the Air Force’s main testing facility. This allowed them to see anything that was going on at Edwards. This route took them right over Plant 42 in Palmdale, where Northrup Grumman was then building B-2 bombers, and where the Lockheed Martin Skunk Works is located. We could see them turn east at the southeast corner of the “no fly zone” and they eventually worked their way around three sides of the box before heading to Las Vegas. This was apparently fully legal under the terms of the Treaty on Open Skies, but also fully obvious. We laughed and laughed. Glad you liked it, guys. I just found that sticker this morning. If you hang out near Denver International Airport long enough, you will see an AN-124. Lockheed Martin uses them to transport rocket boosters IIRC. The thing is huge; it could easily eat a 747. We're at the opposite end of town from DIA unfortunately. I'll have to look through my pictures, but I don't remember having the right angle to get a pic with the An-124 and our B747 together. The guys we talked to in this crew said that most of their cargoes were high end cars like Ferraris and Maseratis.